Just over 45 years ago, in 1970, researchers at the University of Pennsylvania used the best information available at the time to derive a model for development of pulmonary oxygen toxicity.1,2 The measurement they used was decrease in vital capacity (VC), (VC is the volume of air that a person can exhale when starting with full lungs.) and the data came from altitude and hyperbaric exposures to generate oxygen partial pressures (PO2) between normoxic (0.2 bar, 0.2 atm) and 0.5 bar, from sea-level exposures to 83% O2 for 50 hours and to 98% O2 for 72 hours, to hyperbaric exposure to air at 5 bar (PO2 = 1 bar) for 48 hours, and to hyperbaric oxygen (PO2 = 2 bar) for 12 hours. From these data they described exposure to any PO2 as an equivalent number of minutes of 100% oxygen (O2) at 1 bar, the Unit Pulmonary Toxic Dose (UPTD). A median decrease in VC was associated with each number of UPTDs. Exposures to two different PO2 during one dive could be added together for a cumulative dose. Exposures with a time separation, say, a dive followed by recompression treatment, were harder to assess; the UPTD model had no way to include partial recovery. Many studies have been performed since 1970. Let’s fast forward. The group at the University of Pennsylvania who proposed the UPTD model continued to collect hyperbaric chamber data about the development of pulmonary oxygen toxicity. The U.S. Navy Experimental Diving Unit (NEDU) found that the results for PO2s from 1.5 to 2.5 bar3 deviated importantly from the UPTD predictions.4 In fact, the model fit well only to the PO2 = 2 bar study used in the development of the UPTD model (but not to a later PO2 = 2 bar study) and to PO2 = 1.5 bar data. Researchers from Duke University showed that the underlying injury to the lungs differs depending on the exposure PO2 even though the signs and symptom are similar for a large range of PO25 Thus, a single model cannot be expected to fit for all PO2s. The U.S. Navy Treatment Table 6 (TT6) provides 633 UPTDs. This is predicted to cause a 2% (median) decrease in VC, a negligible change. However, among 18 healthy subjects who underwent a TT6 exposure,7 three divers had decreases in VC ranging from 8% to 12%, decreases that lasted from 1 to 3 days. Changes in other pulmonary function variables were also notable in those three and in one other diver. One of the divers reported mild symptoms. Clearly, UPDTs do not provide the full picture. Because VC changes cannot be detected until there is swelling of lung tissues and/or liquid in some of the air spaces (interstitial and/or pulmonary oedema), other markers of pulmonary oxygen toxicity that occur earlier with exposures to low PO2s, for example, symptoms, are preferable. UPTDs have not been correlated to symptoms or to other changes in pulmonary function. We need a model that includes recovery if we are to assess “pulmonary O2 dose” over multiple dives and/or recompression treatments. Science progresses through the proposal of models and hypotheses that are tested initially with one set of data, retested with new data, and either disproven or not disproven. The UPTD model that showed promise in 1970 has been displaced by later evidence. It is time for the diving community to pay attention to the last 40 years of evidence. UPTDs are not a useful measure. Clark JM and Lambertsen CJ. Pulmonary Oxygen Tolerance in Man and Derivation of Pulmonary Oxygen Tolerance Curves, Institute for Environmental Medicine Report No. 1-70, University of Pennsylvania Medical Center, 1970. Bardin H and Lambertsen CJ.  A Quantitative Method for Calculating Cumulative Pulmonary Oxygen Toxicity: use of the Unit Pulmonary Toxicity Dose (UPTD), Institute for Environmental Medicine Report No. 4-70, University of Pennsylvania Medical Center, 1970. Clark JM, Lambertsen CJ, Gelfand R, Flores ND, Pisarello, JB, Rossman, MD, and Elias JA. Effects of Prolonged Oxygen Exposure at 1.5, 2.0, or 2.5 ATA on Pulmonary Function in men (Predictive Studies V), Appl. Physiol. 86 (1): 241–259, 1999. Demchenko IT, Welty-Wolf KE, Allen BW, and Piantadosi CA. Similar but not the Same: Normobaric and Hyperbaric Pulmonary OxygenToxicity, the Role of Nitric Oxide. Am J Physiol Lung Cell Mol Physiol 293: L229–L238, 2007. Arieli, R. Oxygen Toxicity as a Function of Time and PO2, Basic and Clin. Physiol. and Pharmacol. 5 (1): 67–87, 1994. NOTE: Any views or opinions represented in this blog are personal and solely reflect that of the author. It is not representative of any former employer. All content provided by this blog is for informational purposes only. I can’t dispute the assertion made by the author but I’m curious as to the author’s recommendation as to an appropriate way to assess oxygen exposure. The 1970 model is found in instructional texts published as recently as 2011. (1) I agree with Ken’s comment: it’s a shame this blog post doesn’t suggest what model is better for general use. (2) Is it fair to say that the UPTD model predicting linear behavior with time is not unreasonable for pO2s <1.5bar? Significant deviations from linearity at higher pressures may be important for treatment in a hyperbaric chamber, but what about for technical diving where max pO2 is typically <1.4 – 1.6)? Is the recommendation to stop using UPTD calculations in all hyperbaric situations? This useful list of NEDU milestones shows Barbara’s research at NEDU was published in a paper titled “Residual oxygen time model for oxygen partial pressure near 130 kPa (1.3 atm)”.